Committing to cancel the Council housing ‘debt’ if elected to office. Below we explain why these measures are necessary. Council housing is facing a serious funding crisis. Government policies since 2010 are responsible for a significant decline in the income local authorities collect from tenants’ rent. In 2012 a new council housing finance system, self-financing, was introduced. Under this system local authority Housing Revenue Accounts1 receive no subsidy. Their income is overwhelmingly from tenants’ rent and service charges (around 91%)2. In ending the old housing subsidy system, the government divided up what it said was the national council housing debt, and redistributed it amongst councils. More than £13 billion extra debt was imposed on 136 local authorities, whilst 34 had some debt relief. Councils have to repay the principal (the original ‘loan’) and pay interest annually. So hundreds of millions of pounds a year have to be paid to the government’s Public Works Loan Board. This is money which cannot be spent on the upkeep of homes. Swindon was given an extra £138.6 million debt which costs more than £9 million a year to service. Even an authority like Leicester, which was one of the 34 which had their debt reduced, still pays £9 million a year to service theirs. Imposed a 1% rent cut for 4 years. The result of these policies has been that rent income is much lower than planned for in 2012. The 1% rent cut alone is expected to result in a loss of 12% of expected income3. As a result of declining rent income councils are already being forced to cut back spending on maintenance of homes and renewal of key components. Included in the business plan was an estimate of the life span of these components. However, these cuts mean that they cannot be replaced when they should be, threatening a deterioration in the condition of the stock and hence the living conditions of tenants. Swindon is currently estimated to take in £364 million less rent over the remainder of the business plan period than was planned for in 2012. Now the government’s Housing & Planning Act, if implemented4, will mean councils losing even more income as a result of the extension of Right to Buy to housing associations. The Act instructs councils to sell ‘higher value’ homes on the open market, when they become vacant. The money will be used to compensate housing associations for the difference between the discounted Right to Buy price and the market value. Effectively the receipts for these sales will be stolen. The coalition government gave itself the power to review the debt each authority was given if there was a change in the value of the stock. The loss of 12% of income as a result of just one policy is such a change. We are calling on Labour to demand that the current government cancel ‘debt’ in line with the loss of rental income resulting from government policies since 2010. At the very least debt should be reduced in line with the gap between projected income and the 2012 estimate. Labour should highlight the responsibility of the coalition and Tory governments for this funding crisis and demand that the debt is readjusted to take account of income lost. As our pamphlet explains the so-called housing debt was the result of creative accountancy by the Treasury rather than actual borrowing by local authorities. When the new finance system was introduced the government made an £8 billion surplus which was simply pocketed by the Treasury. Council tenants have been fleeced for many years. In reality they have paid more in rent that the debt associated with the cost of building programmes. (see A debt to tenants – why ‘historic debt’ should be written off5.) We are calling on Labour to commit to cancelling the so-called debt if elected to government. This would not only end the injustice suffered by tenants but would be a necessary step towards tackling the chronic housing crisis. Without such action HRAs will continue to suffer declining income. Order copies of our pamphlet (£1 plus postage – email stcg@btinternet.com for payment details). Here is a suggested model resolution. 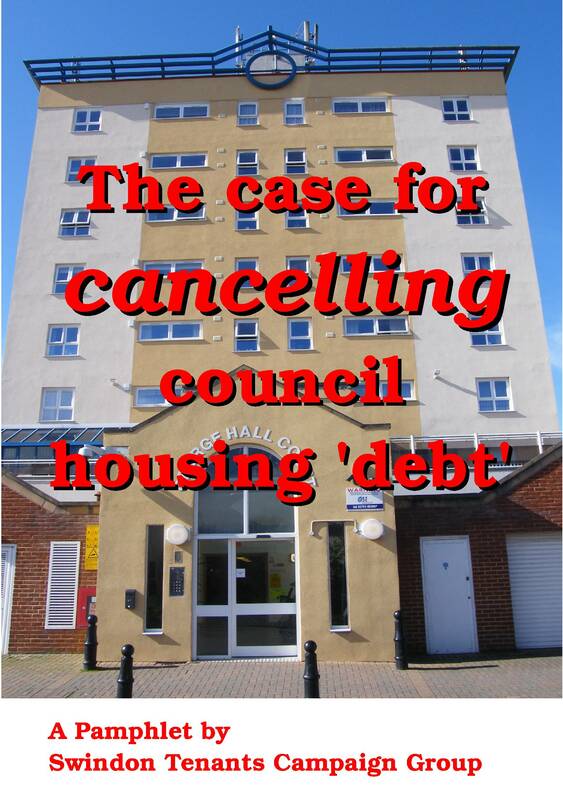 “This branch/organisation recognises that council housing is facing a serious funding crisis as a result of ‘self-financing’ and coalition and Tory government policies since 2010, which have led to a a growing gap between expected rent income and what is actually collected. If you have any questions or points of clarification please contact us. 1This is an account ‘ring-fenced’ within a Council’s General Fund, in effect making sure that council tax isn’t used for housing and tenants’ rent isn’t used for other services. 2They receive small amounts of money from rents for shops and garages, and some money towards supported housing for disabled elderly, disabled or vulnerable people. 3Over the next five years Swindon will take in nearly £45,000 less than planned for in their 2012 business plan. 4The Act is in difficulties with the implementation of the extension of Right to Buy and ‘pay to stay’ delayed. Next Next post: “Affordable Rent”: Slough Council “doing the Conservative government’s dirty work for them”?